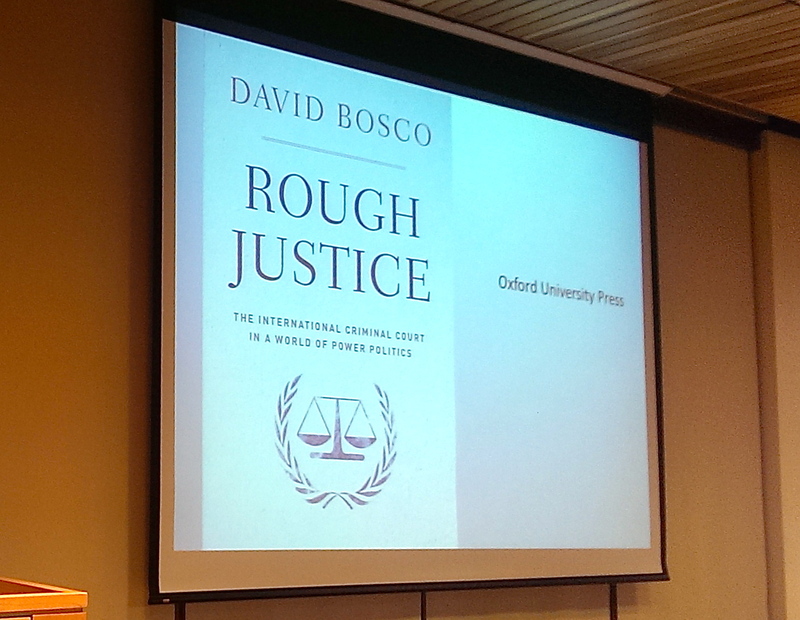 I recently had the opportunity to review David Bosco‘s Rough Justice – The International Criminal Court in a World of Power Politics, for the Journal of International Criminal Justice. Bosco’s is one of the best books published on international criminal justice to date. I highly encourage anyone and everyone interested in the politics of the International Criminal Court (ICC) and international justice more broadly to read the book. Despite a growing body of literature on the politics of the International Criminal Court (ICC), remarkably little is known about how states view and engage in the project of international criminal justice. Even less is known on how the ICC relates to states, state power and how this shapes its decision-making. David Bosco’s Rough Justice is one of — if not, the — most significant contributions to understanding relationships between states and the ICC in recent years. Impressively researched, accessibly composed and cogently argued, Bosco — an Assistant Professor of International Politics at American University — skilfully lays out a political history of the Court that not only elucidates why and how powerful states engage with the ICC but also how the Court manages its relations with the states upon which its legitimacy and effectiveness depend. The primary aim of Bosco’s monograph is to interrogate major power relations with the ICC. How can the differential engagement between major powers and the ICC be explained? How should changes in the engagement of specific states with the Court be understood? How does the ICC prosecutor respond to the political interests of states? To answer these questions, Bosco offers a conceptual framework for analysing and assessing relations between states and the ICC. Bosco suggests that major powers display one of four types of strategies in their engagement with the Court: active marginalization, passive marginalization, control or acceptance. What makes Bosco’s work unique is his subsequent consideration of the feedback in the relationship between powerful actors and the ICC, namely the prosecutor’s behaviour towards states. As Bosco observes, the ‘singular focus’ on how major powers interact with the ICC is ‘characteristic of much scholarship on international institutions’. This occludes, however, the interaction between the institutional interests of actors like the Court and the political interests of states. Bosco maintains that the prosecutor can respond to state strategies towards the Court by assuming its own strategic positions, which he describes as: apolitical, pragmatic, strategic or captured behaviour. Overall, Bosco argues that the relationship between the Court and major powers has been defined by what he terms ‘mutual accommodation’. Major powers have accommodated the ICC as a permanent feature in the latticework of international relations. In return, the Court’s first prosecutor, Luis Moreno Ocampo, gave states an ‘exceptionally cautious court that even sceptical major powers can tolerate and, to a degree, support’. Rough Justice fleshes out Bosco’s thesis with an ‘analytical account’ that is both ‘narrative and historical’. Bosco traces the evolution of the Court and the justice it represents from the Nuremberg trials to the present day. His genealogy gives credence to a view of the Court as a novel institution wary of confronting major powers and ultimately unable to escape politics, power or the politics of power. Unless specifically requested, the Court has avoided intervening in situations or states where major powers are actively engaged or have significant political interests. The result is a Court that propagates rather than challenges selectivity — the selection of which states come under the microscope of prosecutors and which individuals are brought before judges. In the end, Bosco concludes that the ICC is more likely to reflect rather than alter the double standards of global governance. Both liberal and realist oriented scholars should read Bosco’s sophisticated account of the ICC. The book lays bare an institution that is neither independent of politics nor entirely beholden to it. Decisions by prosecutors are not mere reflections of state interests. Nor are prosecutorial decisions above the political fray of international relations. Instead, Bosco presents a fluid realm in which the interests of states and the interests of the ICC are constantly (re)negotiated. You can read the whole review here. More details of the book are available from Oxford University Press. This entry was posted in International Criminal Court (ICC), International Criminal Justice and tagged David Bosco, Rough Justice - The International Criminal Court in a World of Power Politics. Bookmark the permalink.